The species is widespread in the southern half of Britain, but with a scattered and patchy distribution in the north as far as central Scotland. It is widespread in western and central Europe as far north as southern Norway. The species is found in a wide variety of habitats. Adults tend to occur in reasonably tall vegetation in habitats such as rough grassland, woodland rides, field edges, heathland, gardens and marsh edges. The species is easily recognised even in early immature stages. It is extremely variable in colour, much of which appears to be genetically determined. 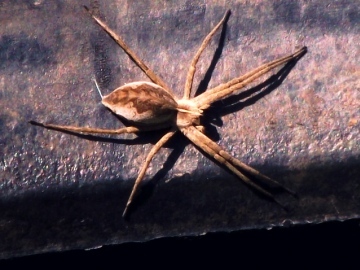 As the spider commonly sits out on leaves, this visible polymorphism may be maintained by the action of predators (G. Oxford, pers. comm.). Adults of both sexes are found mainly between May and July. The male catches a fly or other prey item as a courtship 'gift' for the female during mating. The female carries the egg-cocoon in her chelicerae until the eggs are about to hatch, when she constructs a tent-like web in tall herbage in which young remain until they disperse. Apparently this maternal care is not very successful against ichneumons (Bristowe 1958). Common in the south, but becoming more infrequent in the north. Pisaura Mirabilis with egg sac.